Well that was a rough night on Slayer II. I already don’t like flying and that squall that came through last night just showed that I was more than ready to get my feet back on the ground. I was thankful when we docked at House Kundarak. As I was disembarking, Erdrique motioned me to the side and asked me to check in with Lorridan Silvermantle in the Ever Full Flagon Inn. 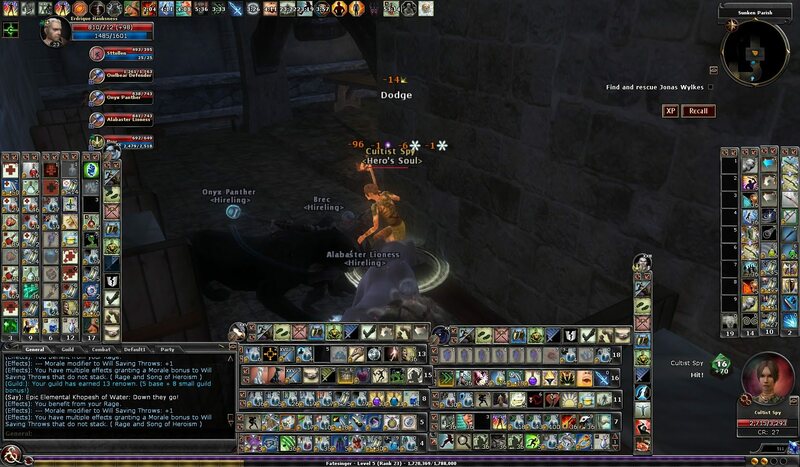 Evidently Lorridan needs some help and he had contacted the guild to set up a contract. I caught up with Breyy and had asked him to come along as well. It didn’t take very long to make it from the airship docks to the Ever Full Flagon. Once inside, we made our way to the inn owner and asked if he knew of Lorridan Silvermantle. He pointed to a small table where Lorridan Silvermantle was sitting and talking to another person. When we approached the table, Lorridan looked up and he seemed recognized our guild emblems. He excused himself from his table mate and then ushered us to another empty table. He then proceeded to tell us of the trouble he was having. 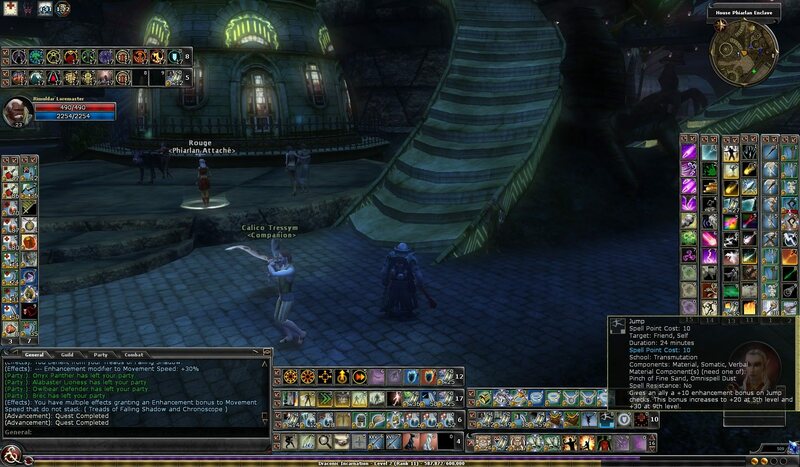 Lorridan explained the situation with a Kundarak owned warehouse known as the Lair of Summoning. Evidently the tenant of the lair had been evicted. However, the past two times House Kundarak has sent in messengers to deliver the eviction notice, they haven’t returned. Lorridan fears what might be in the lair and wants us to explore it. Once we finished learning about the Lair of Summoning, we left the Ever Full Flagon and walked down the alley to where its entrance was located. We quietly entered and then started to explore the lair. The opening hallway was eerily quiet. To help us along, we also recruited Pius r’Simon, a local mercenary who we worked with before. We also had Spike, Breyy’s iron defender. The four of us slowly made our way through the opening hallway until it ended with a door to the east and another door to the west. We decided to go west. It didn’t take long to run into trouble. The first thing we noticed were large piles of rocks at the end of the corridor along with pieces of what appeared to be broken stone columns. In the middle of the corridor was set of stairs. As we progressed to stairs we heard a “hiss” and then noticed a stream of poison gas heading directly at us. We had sprung a poison trap. We did get hit by it, but we dodged the worst of the damage. After we took care of our wounds, we then walked up the stairs and jumped back. The piles of rocks started to move and tumble of their own freewill. We quickly realized that these weren’t plain rocks and rubble but were instead three vary large and dangerous earth elementals. It was a fierce and unexpected battle but we were finally able to defeat them. The corridor with the earth elementals lead to a hallway that went south. Down that hallway was another gate. Also down that hallway were two platforms, one on each side and with each having a gargoyle resting on it. I couldn’t tell from this distance if the gargoyles were alive or just true statutes but I figured with our luck they would be alive and we would be attacked as soon as we approached. And I was right. As we crept down the hall, the gargoyles sprang to life, hissing and clawing towards us. They put up a good fight but we finally defeated them. Worn out, we continued on. When we approached the gate, we felt electricity surge in the air. We had set off yet another trap. And to make things worse, the gate was locked. We pushed through the lightning trap and Breyy made short work of the lock. Once through the gate we were in another room that went east and west. The room appeared to be some type of storage room with crates, sacks, and barrels lying about. We set out looting the room when we realized we weren’t alone. We first heard some growling and then saw flashes of white fur. We then realized that we walked into a room that was guarded by winter wolves. The winter wolves were more coordinated than the earth elementals and gargoyles, working well in a pack. To make things worse their breath attack was difficult to defend against. Once we cleared the room of the winter wolves, we headed west and then south down another long corridor. It didn’t take us very long before we ran into another trap. This was a sonic trap and it was quite devastating. Spike took a severe amount of damage and Breyy needed to revive him before we could move on. Pius and Breyy also sustained a large amount of damage but I was able to heal those wounds. We then continued down the hall to encounter two more gargoyles, although we were prepared this time and these gargoyles went down much easier. We then entered another square chamber that had a portcullis blocking the south passage and another hall that east. When we started to down the eastern hallway we noticed a lever and when we pulled it we heard the portcullis blocking the southern passage open up. As we went to the lever, we noticed that hallway was slick and that another door was at the end of the hall. We then noticed that the hallway wasn’t only slick but that the moisture was moving, we had come across some slimes. Although annoying, using the glass club known as Muckbane, they didn’t last very long. Before we made our way down the south passage, we opened door at the end of the hall to find a shrine and a convenient place to rest. We took advantage of that situation. After the brief rest, we back to the room and down the south passage. The south passage led to another larger room with a kind of altar in the middle. Before we could make our way into the room, we were attacked by another pair of winter wolves, who were acting as sentries in the hall. After a brief battle with them, we entered the room. The altar was surrounded by four runes. These runes were mounted on each side of the square altar. We activated each rune by stepping up to it. When all four runes were lit, the altar erupted in flame and a large flame elemental appeared and advanced on us. We were also attacked from behind by a party of air mephits. The ensuing battle was nothing short of fierce. We were dodging flames and attacks from every which direction. Spike and Pius, again, took severe amounts of damage. Luckily I was able to use their sacrifices to defeat the remaining enemies. Once that was done, we noticed a back way out of the lair. I’m not sure who exactly was using this space but Lorridan most of known the types of things that were in here. All I can say, is that he better give us a pretty big payout. Although last week my questing was lite, the weekend was a little more productive. On Friday, I dual boxed with Erdrique (Level 23 Bard/Fatesinger) and Sttollen (Level 22 Rogue/Shadowdancer) and I attempted to complete Terminal Delirium on heroic elite once again. However, just like the previous weekend, I failed horribley…twice. I died both times in the mirror room :(. Those were the only runs I got in on Friday night. Erdrique and Sttollen trying Terminal Delirium once again. I didn’t log in again until Sunday night. 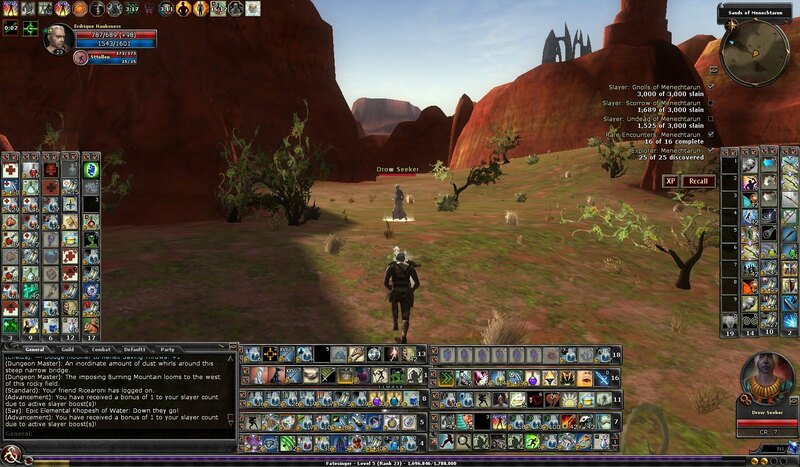 Once again I logged in with Erdrique and Sttollen and took them out into the Sands of Menechtarun. They picked up 274 scorrow and 59 undead slayers. They also took down Wokran-Kull, Utach Sandscrawl, Volrune the Curate, Mendexthazz, and Palumak. 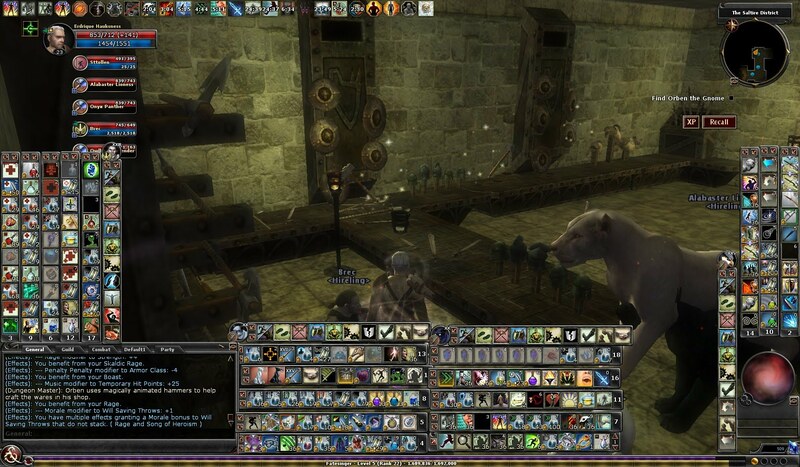 I was then joined by Hellsblaster (Leve 26 Artificer) and he mentioned he would help with Terminal Delirium. With his help we ran into a lot less problems. Our biggest area of concern was the mirror room but once we made it past that the balloon and tile pieces were easy to take care of. Needless to say, I was very grateful for the help!! Erdrique also picked up a monster manual deed while in there, mind flayer exterminator II (2,540 experience). Hellsblaster called it a night after that so I took Erdrique and Sttollen back out into the desert and collected another 133 scorrow as well as defeating Utach Sandcrawl, Volrune, and Mendexthazz. I then took Erdrique and Sttollen into the Inspired Quarter where I ran the Dream Conspiracy on elite. I had little problems in that quest. I then picked up the quest for The Shipwrecked Spy and ran that quest on elite as well. I had little difficulty in this quest as well and picked up the optionals for getting past the first two waves of enemies as well as finding the hidden treasure. During these runs, Erdrique hit level 24, so not a bad night. I called it a night after completing The Shipwrecked Spy. Erdrique is hunting scorrow in the desert. Trying Terminal Delirium yet again, but this time with Hellsblaster. Going on another scorrow hunting expedition in the desert. Working our way through Dream Conspiracy. Looking for the shipwrecked spy. I hope everybody else had a great weekend!! 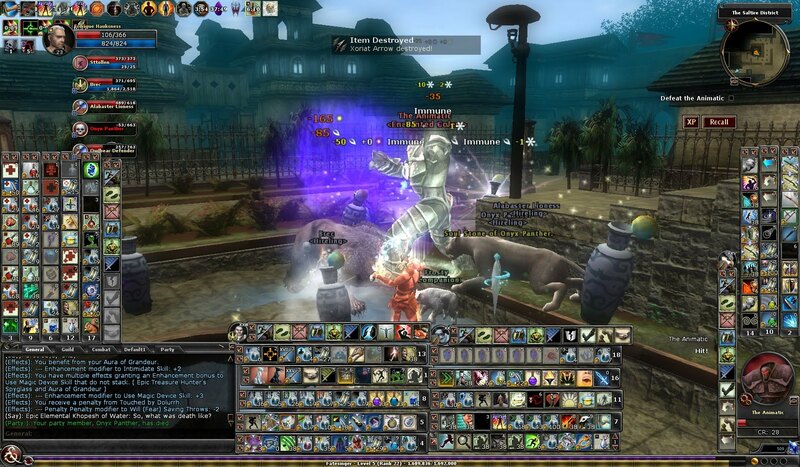 Thanks for reading and happy hunting in DDO!! This past weekend, Erdrique hit another level. After I took him through Dream Conspiracy on elite he picked up enough experience to reach level 24. I went ahead and put another attribute into Charisma, giving him a total score of 50. I also decided to stay in the bard theme and took Master of Music as his feat. Erdrique now has a 50 Charisma. Taking the Master of Music feat. I hope everybody else was able to have a productive weekend. Thanks for reading and happy hunting!! The developers recently made some changes to the bard class which included the addition and change to the capstone of the Warchanter enhancement line. This change includes a new enhancement called Skaldic Scream. The other day I was running Acute Delirium with Dirtyrice and used it on a group of flesh renders. I was able to instantly freeze three of them. It definitely is a fun enhancement and I’ll have to see which tends to capture more enemies in a frozen state, Skaldic Scream or Spinning Ice. Maybe I can calculate a freeze per attempt to compare these different abilities. Erdrique using Skaldic Scream to freeze some flesh renders in their tracks. Skaldic Scream is the captsone to the Warchanter tree. I didn’t get a chance to log back into DDO until Thursday. I logged back in with Rimuldar and continued on my quest to get the most favor I can with my characters. For some odd reason he still needed the Phiarlan Carnival quest chain on elite. So I quickly took him through A Small Problem, Partycrashers, and The Snitch on heroic elite. I didn’t have enough time to work my way through Under the Big Top so I will have to work on that next time. Rimuldar heading into A Small Problem. Rimuldar taking care of The Snitch. Thanks for reading everybody and I hope others had a more productive week than I did. Happy hunting everybody!! 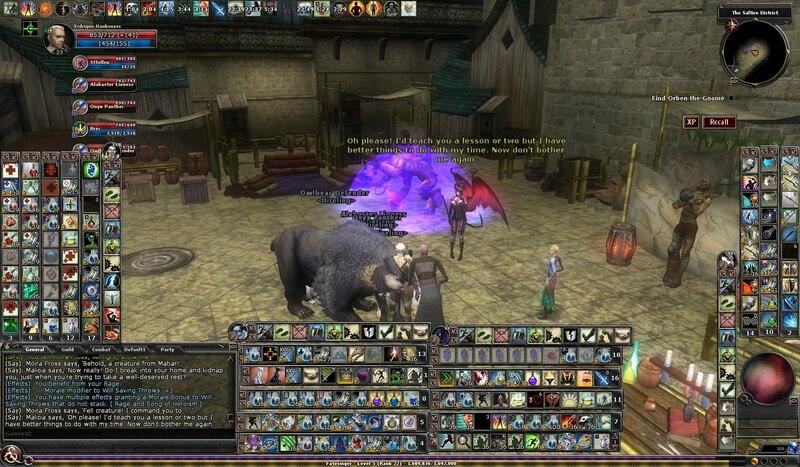 One of the more interesting aspects to DDO is the ability to create diverse characters by spending skill points across the multitude of available skills in the game during character creation. One of the skills that I have found extremely useful is Jump. 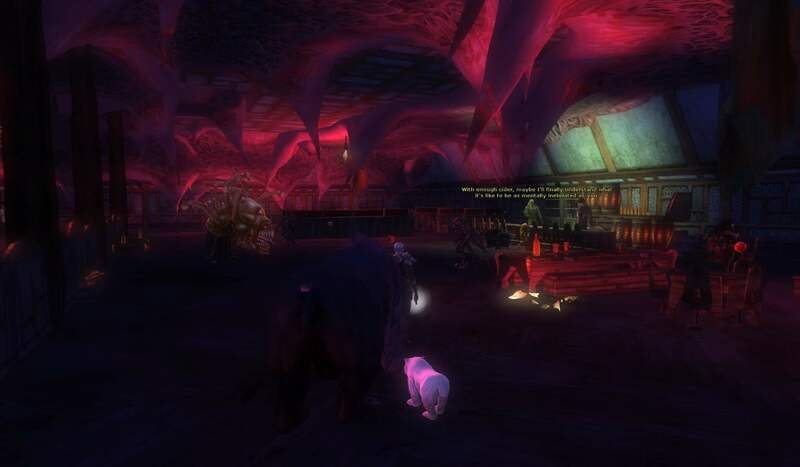 One thing that I learned very quickly in my questing career was that many of the dungeons in DDO have a number of different areas that you need to either climb or jump over. These include various traps, different sizes of crates, various sizes of holes and crevices, and trying to reach ladders (among many others). 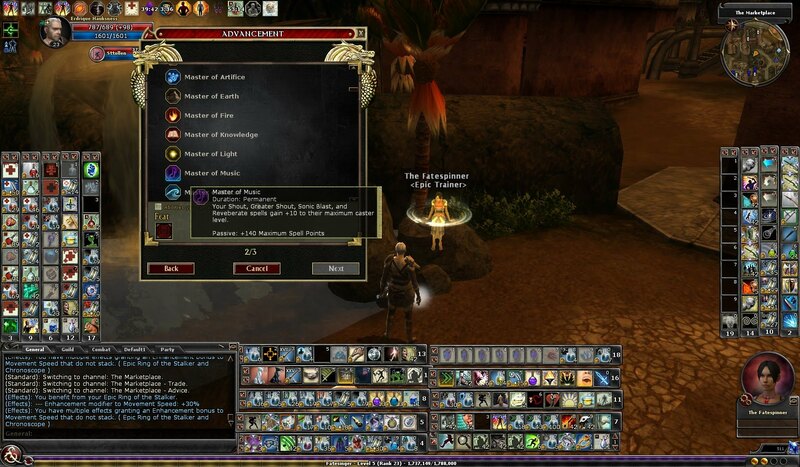 By spending points in Jump during your character creation, you will be able to make your questing much easier. However, you can’t always spend points in Jump while you are creating your character or as you level up. However, the Jump skill can be augmented with Jump potions and the Jump spell (either from your spell list or from scrolls). I always carry these on my characters, potions on melee characters and scrolls for casters that don’t have the spell already loaded. You can also wear various items that have a jump enhancement to also increase your jump skill (take note that these various types of increasing your jump skill don’t always stack with each other). Rimuldar knows how useful Jump is. The Jump skill itself will maxes out at 40. Once you hit that number, you don’t really get any other additional benefit from the skill. 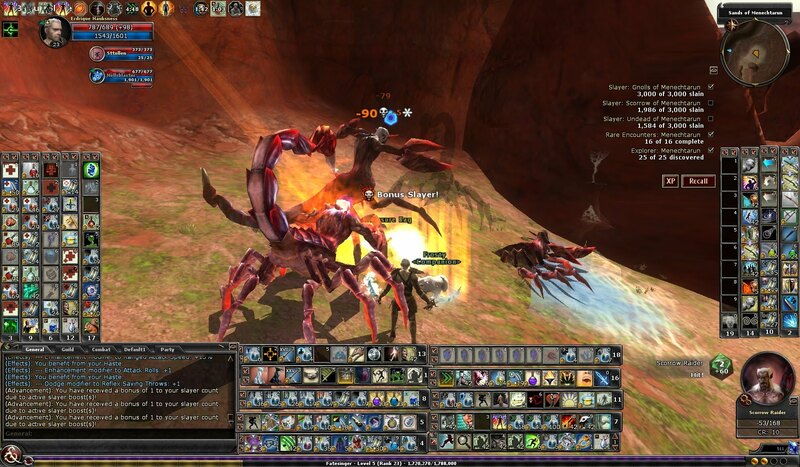 By having a high jump your character will be able to navigate through the majority of quests and dungeons much easier. If you have a character that doesn’t have a lot of skill points spent in Jump, especially those melees that wear heavy armor, make your life a little easier by carrying jump potions. I don’t think you will be disappointed. As I noted here, I recently ran the quest Good Intentions for the first time. I found the quest to be fun and light hearted. It maintained that classic feature of a gnome who meant to do something good but watched it go horribly awry. I also liked that Good Intentions revisited the Saltire District of Stormreach. The last time we visited the Saltire District was during the quest Missing where our adventurers discovered the beginning plots and horrible creations of Yaulthon. Erd taking a look around in Good Intentions. I also found the initial interactions with the various NPCs fun. It was interesting to see a human summoning Malicia into the quest. I also found it interesting to learn that Malicia might actually be from Mabar. At least that is what we glimpse from the brief conversation you see that occurs as you approach the wizard Moira Fross (who summoned Malicia). I found it funny when Moira tries to command her and Malicia just blows her off and leaves. So is Malicia really from Mabar? The initial beginning of the quest reminds you of the realm of Harry Potter, where you walk into a house and the chores are being completed by animated utensils and tools. But I will say, the monsters are quite challenging. The various types of constructs you come across are numerous and this mainly because the “Animator” is magically turning these things into animated objects to help the citizens of the Saltire District. Too bad it gets out of hand. It would be nice to have the dishes wash themselves!! The Animator creating havoc in the Saltire District. In sure I’ll do something a little more in depth in the future. If you haven’t had a chance yet to run this quest, I would recommend it. It is a little different. Thanks for reading everybody and happy hunting in the Saltire District! !